Wahama sophomore Hannah Rose belts out a hit during an April 12 softball contest against Buffalo in Hartford, W.Va.
CHARLESTON, W.Va. — A triple threat. 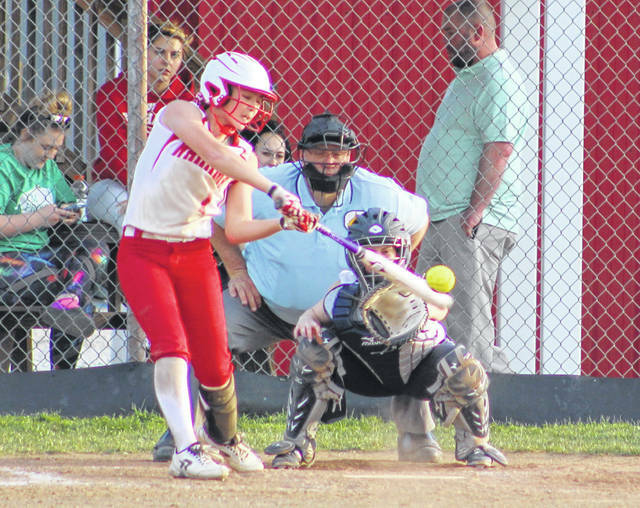 Wahama landed three players on the West Virginia Sports Writers’ Association Class A all-state softball teams for the 2018 campaign — as voted on by a select panel of media members throughout the Mountain State. Hannah Rose, Emily VanMatre and Emma Gibbs each garnered all-state accolades for their efforts this past season, a spring that witnessed the Lady Falcons put together a 19-12 overall record. Rose — a sophomore — repeated as a first team infielder, while VanMatre — a junior — came away with special mention honors. Gibbs — a freshman — was also named to the honorable mention list. Both VanMatre and Gibbs are first-time recipients of all-state accolades in softball. Rose — the regular starting shortstop — collected 71 hits and a .696 batting average. Rose accumulated 17 doubles, seven triples and three homers while driving in 39 RBIs and scoring 60 runs. VanMatre collected 51 hits and a .500 batting average, which included nine doubles, four triples and one home run to go along with 37 RBIs. Gibbs produced 50 hits and a .490 batting average while knocking in 36 RBIs and scoring 39 times. Wheeling Central senior Riley Bennington — a pitcher — was named the first team captain, while Greenbrier West senior Brittany Bevins — an infielder — was chosen as the second team captain. Pitchers: Riley Bennington, Wheeling Central, Sr (captain); Autumn Thompson, Sherman, Jr; Chloe Elliott, Ritchie County, Fr; Katie Gasvoda, Madonna, Sr.
Infielders: Hannah Rose, Wahama, So; Jairika Baylor, Wheeling Central, Fr; Kendall Bowen, Ravenswood, Jr; Katlyn Rasnake, Buffalo, Sr; Reegan Lively, Greenbrier West, So. Outfielders: Taylor Townsend, Pendleton County, Sr; Aubrey Neff, Paden City, Sr; Sophia Recrosio, Madonna, Jr.
Catcher: Skylar Bogan, Wirt County, Sr.
Utility: Rebekah Markwood, Moorefield, Jr; Ashley Fridley, Fayetteville, Sr; Kira Riffle, Notre Dame, Jr; Caitlyn Kassay, Clay-Battelle, Jr; Ashley Tharp, Magnolia, Jr.
Pitchers: Lindsey Russell, Buffalo, So; Marissa Garlitz, Wheeling Central, Sr; Hanna Carlson, Moorefield, So; Brooke Miller, East Hardy, Sr.
Infielders: Karena Recrosio, Madonna, Fr; Carrie Taylor, Fayetteville, Sr; Katlyn Jenkins, Sherman, Jr; Hannah Loy, Paden City, Jr; Brittany Bevins, Greenbrier West, Sr (captain). Outfielders: Anna Riggleman, Moorefield, So; Morgan Turner, Notre Dame, So; Rylin Tabor, Ravenswood, So. Catchers: Alexis Schreckengost, Williamstown, So; Sam Holbrook, Fayetteville, Sr.
Utility: Kaysee Amick, Richwood, Sr; Kenley Posten, Greenbrier West, So; Abbey Ammons, Clay-Battelle, Sr; Remi Hinkle, Moorefield, Fr. Olivia Carpenter, Wheeling Central; Ally Davidson, Wheeling Central; Paige Brill, Magnolia; Maggie Bird, Buffalo; Olivia Corbett, Charleston Catholic; Sakoya Riffle, Doddridge County; Gracie Gipson, Valley Fayette; Tiffani Cline, Summers County; Madison Dennis, Calhoun County; Kayla Randolph, Wirt County; Bayley Wellings, Gilmer County; Mahayla Nichols, St. Marys; Emma McKeen, Notre Dame; Savannah Swenskie, South Harrison; Madison McGregor, Moorefield; Reyenne Colaw, Pendleton County; Skye Metzer, East Hardy; Emily VanMatre, Wahama; Nina Maynard, Tolsia. Kaitlyn Ferns, Wheeling Central; Emilee Ondrik, Wheeling Central; Madalena Daugherty, Madonna; Courtney Walker, Cameron; Jenna Ferrebee, Paden City; Alivia Anderson, Magnolia; Ashlyn Piekarski, Magnolia; Brooke Persinger, Buffalo; Kelly Kreitzer, Charleston Catholic; Jacqueline Marchese, Doddridge County; Courtney Sanford, Doddridge County; Brooklyn Hinzman, Doddridge County; Skylar Richards, Fayetteville; Cameron Dorsey, Greenbrier West; Rachel Adkins, Greenbrier West; Katie Frazier, Wirt County; Taylor Tribett, Ravenswood; Haley Wanstreet, Gilmer County; Keely Alsup, Williamstown; Brianna Jones, Ritchie County; JoLee Walton, Tyler Consolidated; Jessica Mordan, Notre Dame; Jocelyn Heckert, South Harrison; Alyssa Vetter, Moorefield; Dominique Meadows, Tucker County; Julia Hahn, East Hardy; Emma Gibbs, Wahama; Destiny Ball, Montcalm; Izzy Simpkins, Tolsia.